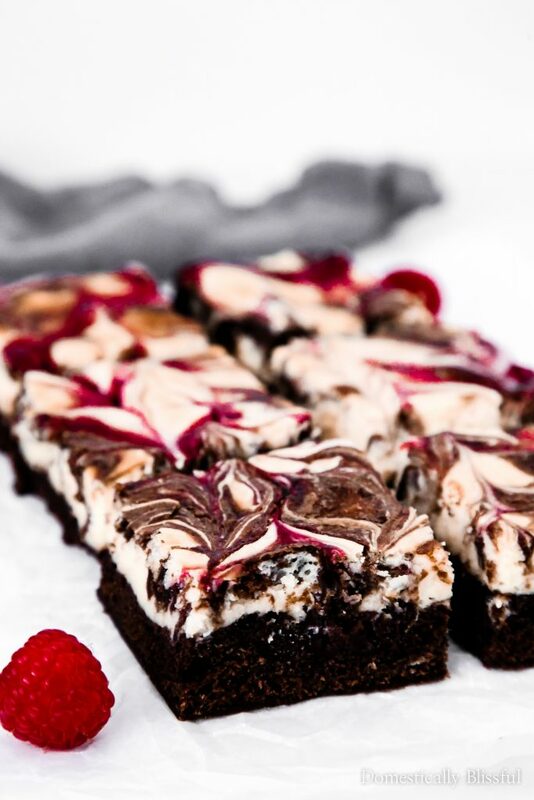 These Raspberry Cheesecake Brownies have a homemade creamy cheesecake, sweet raspberries, & a rich chocolate brownie that make it the perfect dessert for summer parties & Valentine’s Day. 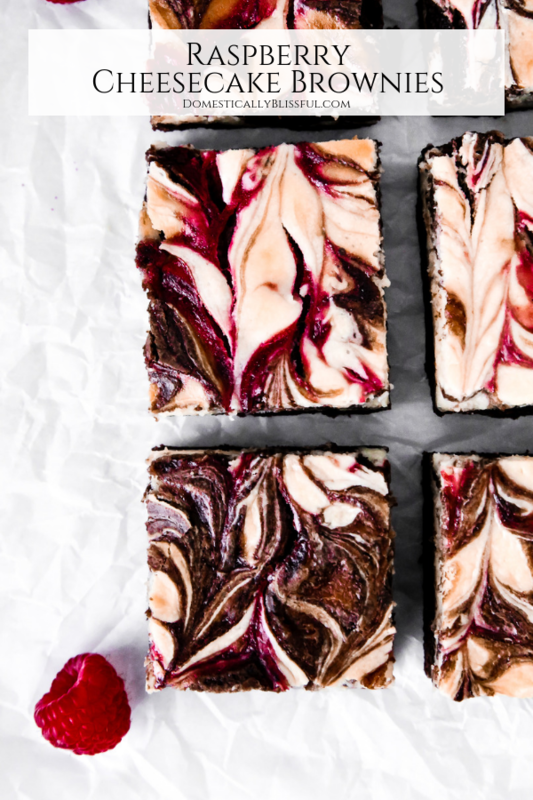 Sharing a new berry cheesecake brownie recipe has become somewhat of a yearly tradition that I started back in 2017. The first one I created was a Blackberry Cheesecake OREO Brownies recipe in 2017 & then last year I created a Blueberry Cheesecake Brownies recipe. And I almost forgot that I also shared a Pumpkin Spice Cheesecake Brownies recipe in the fall. However, I don’t think that one should count since pumpkins aren’t a berry, even if they are a fruit. But since I did technically share two different types of cream cheese brownies last year I’ve decided to try & only share one this year because I don’t want to overdo it on the cheesecake brownie recipes. 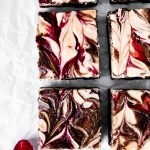 So I decided to make this year’s cheesecake brownies recipe extra memorable & delicious by creating these Raspberry Cheesecake Brownies. They are so good my sister-in-law even ate one for breakfast! Don’t worry sis, I’ll keep your identity a secret so no one knows you sometimes eat dessert for breakfast. But if we were all honest, we would have to admit that we do it too! 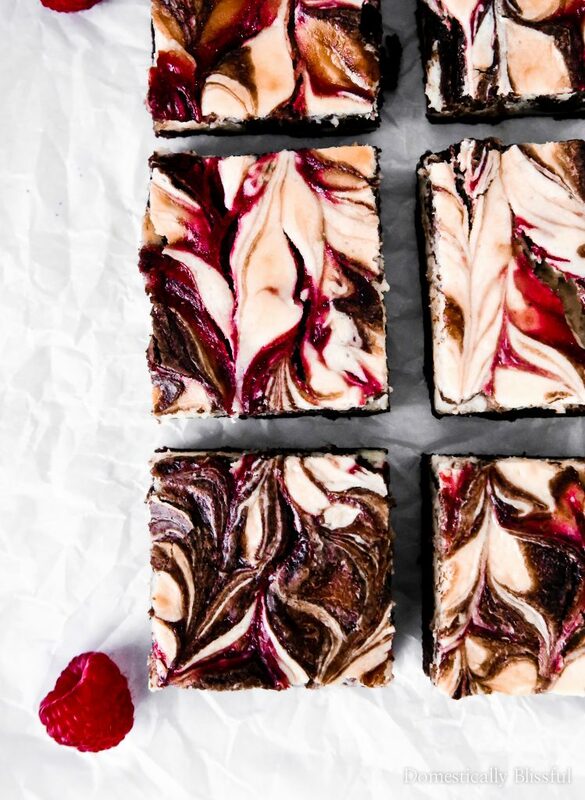 And you’ll definitely want to with these Raspberry Cheesecake Brownies! First, preheat the oven according to the brownie mix recipe instructions, follow the directions to make the brownie batter, & set to the side. Next, use an electric blender at medium to high speed to blend the cream cheese until light & creamy. Then blend in the 2/3 cup of sugar, 2 eggs, & 2 teaspoons vanilla extract. Set to the side. Puree the raspberries, strain if desired, & stir in the sugar. In a baking dish (13X9) sprayed with oil or lined with parchment paper, pour the brownie mix (reserving 1/4 cup) & spread evenly on the bottom of the pan. Then cover it with the cheesecake mixture (reserving 1/4 cup). Finally, drizzle raspberry mixture on top of the cheesecake adding dollops of brownie mix and cheesecake mixture as needed. Swirl the mixture with a toothpick to create a marbled pattern. Bake for 25-30 minutes uncovered (until almost golden) & then for an additional 10-15 minutes covered with foil, or until the cheesecake is firm & a toothpick comes out clean. Let cool & refrigerate for 2 hours or overnight. Keep leftovers in a lightly sealed container in the fridge for 3-5 days. If you want to make the flavor of raspberries stronger double this amount to 12 ounces raspberries & 2 tablespoons sugar. 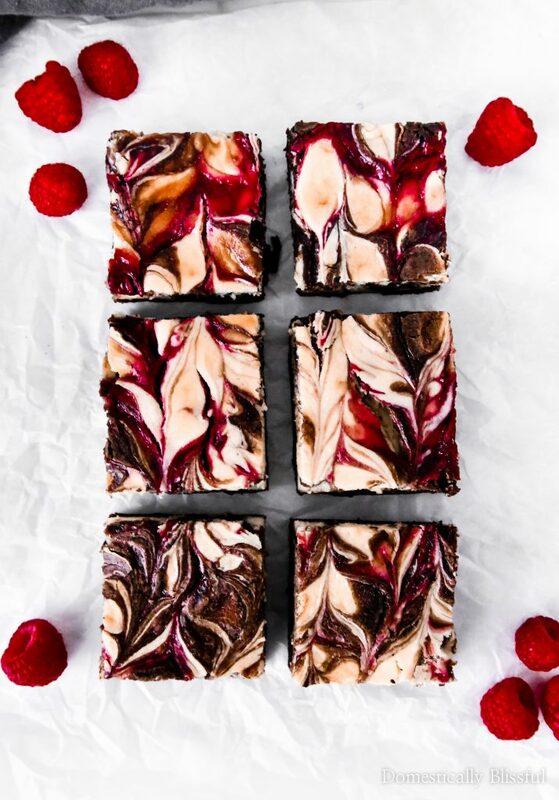 If you make these Raspberry Cheesecake Brownies be sure to share a picture & tag @DomesticallyBlissful on Instagram so that we can all see your chocolate raspberry dessert! What is your favorite thing about this recipe, the cheesecake, brownies, or the raspberries?